It’s a beautiful Belle Isle morning. Right now, no noise, no traffic, just a beautiful sunrise. The Miami Herald reports tonight that Miami Beach Mayor Philip Levine has decided he won’t vote Wednesday on a proposal to allow a luxury retail residential complex on Purdy Avenue to rise 90 feet instead of 50. Levine is part-owner of properties next to the proposed complex, Sunset Harbor Residences. The eastern drawbridge on Venetian Way is stuck in the up position for the second time today, and getting back to the mainland is a giant pain. It’s a taste of what we’ll experience daily starting in about six weeks. The reconstruction of the westernmost Venetian Causeway bridge, between mainland Miami and Biscayne Island, looks likely to start after June 1. City commissioners were briefed about the timetable on Wednesday, and residents attended a community meeting Thursday night at the Miami Beach Police station. The Coast Guard, according to the city, has agreed that during construction, the drawbridge on the eastern side of the causeway will remain locked down and only raised for Coast Guard emergency vehicles in emergency situations. If only that span were locked down today….. If you feel like that the construction projects around our island paradise never end, that’s because….they never end. — A report from the city of Miami Beach on the construction timeline and design for the West Avenue bridge, which will extend West Avenue over the Collins Canal to connect Sunset Harbour with the area south of 17th Street. — An overview of the upcoming reconstruction of West Avenue south to Fifth Street, including the plan to raise the roadway as much as three feet to combat flooding. — A presentation from the organization that is fighting the proposed mega-marina project on Watson Island, which is expected to affect traffic on the MacArthur, Tuttle and Venetian causeways. And that’s just a start. The meeting begins with a social hour at 6 p.m., and important information at 7 p.m. It happens in the card room at Belle Plaza, 20 Island Avenue. 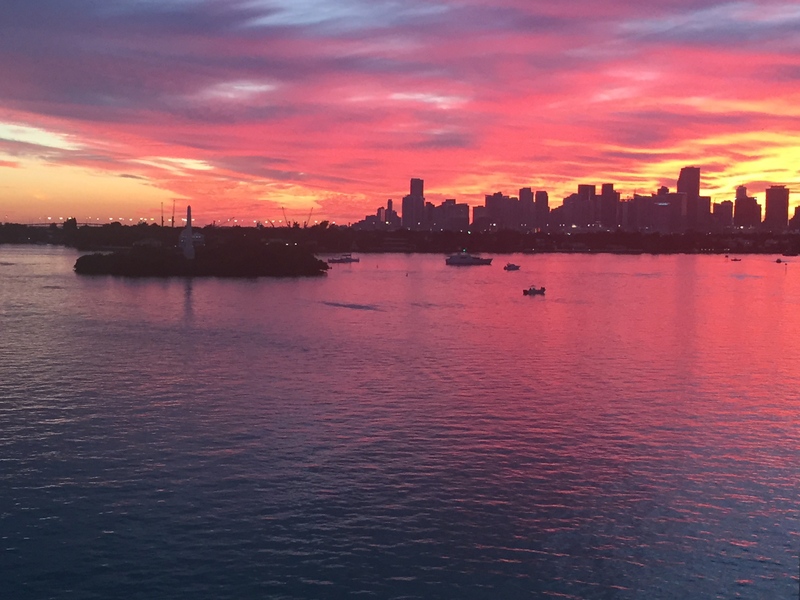 A Belle Isle sunset over Miami, no filter. Could there be a more beautiful end to a beautiful day? Perfect weather, perfect place. The green market in the breezeway of the Sunset Harbour shops returns from its summer hiatus on Wednesday from 11 a.m. to 6 p.m., with many of the vendors from last year. Vendors include Paradise Farms, Armando’s Tropical Fruits, Tio Gazpacho, Nisha’s Indian Cuisine, Della Nona Pasta, Dogtailz and Sydney’s Fresh Flowers. Critical Mass, the massive monthly bike ride, happens Friday night and is sure to shutdown traffic around our islands. The ride starts at 7:15 p.m. on the mainland, and is expected to reach North Beach (over the 79th Street Causeway) at about 7:45 p.m.
From there, riders will head east to Collins Avenue, south to 23rd Street, and then west on Dade Boulevard to Venetian Way and across the islands to mainland Miami. Plan on being home before the bike traffic, or travel on foot — or get caught in gridlock.